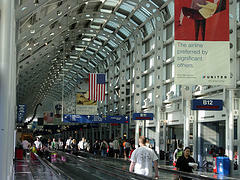 More than 190,000 people travel through O’Hare Airport every day. 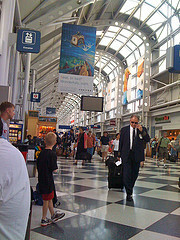 O’Hare provides connections to more cities than any other airport in the world. So what happens when a monitor needs to be repaired, or glass elevator breaks down? How are airport repairs conducted in the middle of an occupied terminal? The answer is portable Screenflex Room Dividers. Portable dividers provide safe conditions for workers and pedestrians while construction arises. Archer Contractors have been working on updating, repairing and constructing various projects at O’Hare Airport for over a year. Archer has used Screenflex dividers to hide construction debris and create a visually appealing wall for pedestrians. Block stairs to fix escalators and keep people from entering. Keep elevator glass enclosed while contractors re-do the glass. Creating an island with the dividers to completely cover a scissor lift. Creating a room while new monitors are mounted. Keeping dust and hazards contained. 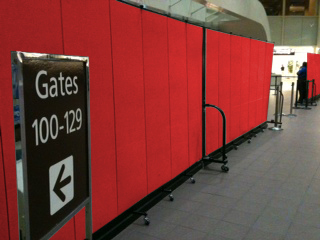 Screenflex sound absorbing panels help to absorb construction noise in the terminal where drilling or other construction noise exists. Dividers create a path for people to walk. Portable walls are strung together so contractors can install blinds and mechanical shades. Blocking off areas creates a safe environment for people to walk around while floors are being refurbished. One of the busiest airports in the country, O’Hare Airport in Chicago, Illinois can conduct construction and repairs without a lot of commotion to airline passengers by using room dividers. We purchased seven dividers from Screenflex. Our dividers keep the public safe and out of the work space. The airport is now requesting that we use our Screenflex walls during construction. We are happy with the dividers. They provide a nice visual appeal instead of using a construction fence. To see more examples of how airports are using our room dividers.